City Paint Phoenix 20 – Hiding…maybe…? I haven’t been near Roosevelt Row in some time…so it was a pleasant surprise to find some new (?) work. This single mural is on the east-facing wall of 407 E Roosevelt Street in what is essentially downtown Phoenix…on what I understand to be an art gallery named “modified/arts.” I don’t know the name of the mural or exactly what the artist is conveying…but I don’t want to, either…the possibilities and what they strike in my mind are enough…. The artist is Hugo Medina. Please click on his name for more information about him and his work. I haven’t had any new hiking adventures of late, but I did come across a nice mural the other day on my lunch-time walk. This one was kind of a surprise, as I literally drive past the place every other day or so and had not seen it. This mural is on the west side of Fernando’s Alignment Shop at 1946 E Roosevelt Street, a bit east of downtown and three real blocks away from my workplace. There are other lesser-quality paintings on a couple of the other walls, so it was something of a treat to find this one. I don’t get involved in politics on my blog and I’m not going to do so now, but it appears that this mural is in support of the “#nodapl” movement…which you can read about here and here, pages that present both sides of the issue. 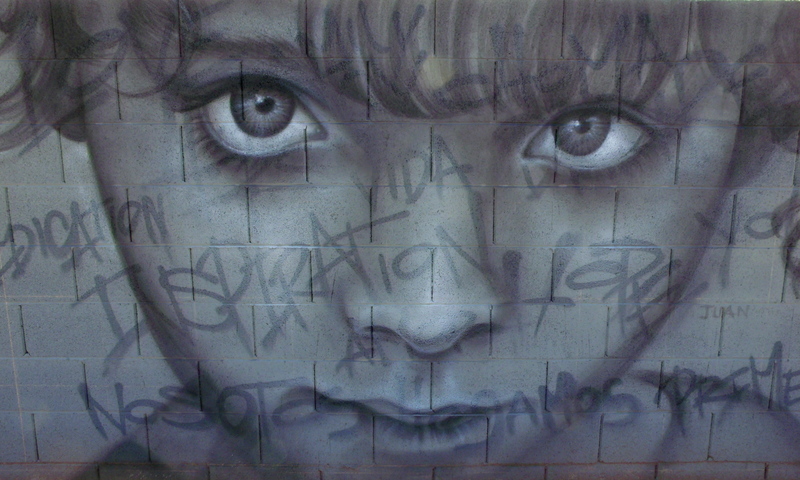 My sharing of the mural here is simply to share the mural…the street/building art that I have found in Phoenix. The second, third, and fourth images are the left, center, and right panels of the mural…. And the following gallery is simply a set of close-up images focusing on separate sections…. In attempting to give credit to the artist, I researched the name/label that we can see in the far right, lower section of the mural, something that looks like “Gua Che Collection 2016,” and couldn’t find anything relating to a particular artist’s collection. It appears that “gouache” is simply a type of painting…anyway, here it is…..yet another example of iphound art in Phoenix….enjoy. When a couple of you mentioned that the man in the last installment of City Paint Phoenix looked like David Bowie, it reminded me that I had previously observed a section of city wall that had actually been decorated with images that were very distinctly Bowie. 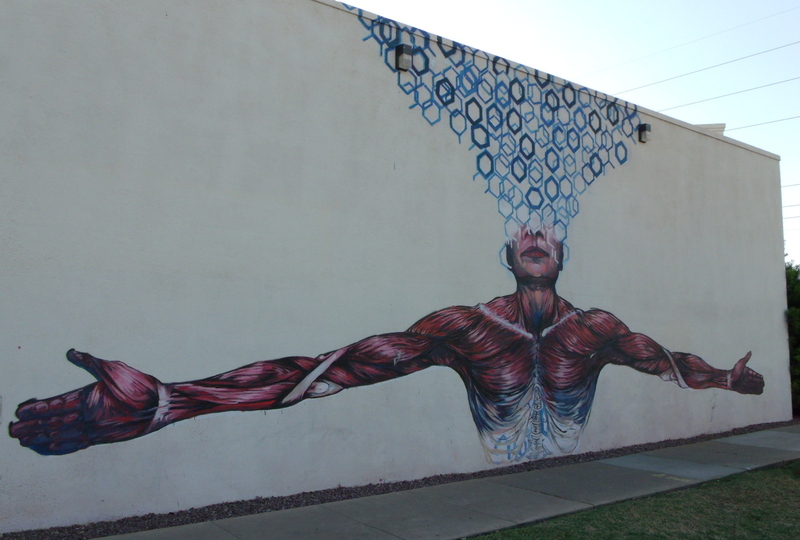 The mural is located at 1715 N 7th Street in Phoenix, about one block north of McDowell Road for any local readers…. While I was never a fan, I understand that David Bowie was an iconic figure in the music world for a period that spanned decades. So instead of blabbing on and on about the guy and his career from any research that I would have had to conduct in order to do so, I will simply offer that I find the mural and the skill of the artist to be rather compelling…. And lastly, to give proper credit for the work, I will close the post with a panel sharing the artist’s information…Maggie Keane…please click on her highlighted name to learn a little more about her. As always, thank you for visiting and viewing another presentation of iPhound beauty…. 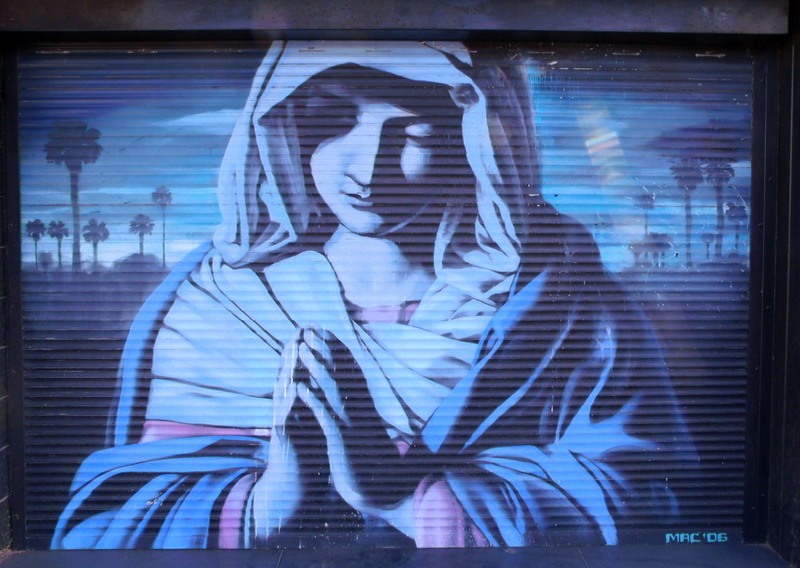 If you’d like to view other presentations of street art from both Phoenix and Salt Lake City, you can click on this link to be taken to a continuous scroll of the posts. Found in an alleyway where people park their garbage cans so the collection service can do their thing and haul away the waste. There was a stretch of decorated wall that ran more than 100 yards deep into the alley…the backsides of backyard walls in a mid-city residential area. The art was created as part of Paint Phx 2015.